Well, BOO to you!! It's time to sit back and have a little fun--it's MFT Blog Hop Time! You'll want to start at the beginning on Kim's blog, HERE to be able to enjoy all the spooky sweet goodness! Don't fear the unknown, but somewhere along the hop, one of us has blog candy! However, WHO the candy giver is and WHO the winner is won't be revealed until tomorrow night at the release party! So you'll want to be sure to leave a comment on every blog to have the most chances of winning! It's like a MYSTERY LOTTERY STAMP WINNING machine! 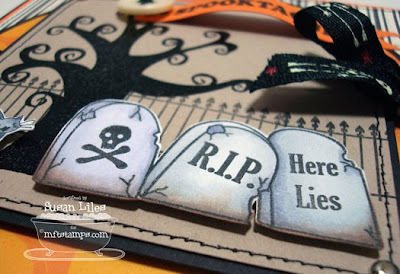 For my blog hop sample, I used two of the new sets--The tombstones come from the Ghoulish Label Set, but the majority of the scene was made using Too Cute To Spook (which is also a sentiment included in the set!). This set is an "MFT Presents Stephanie Fizer" set, and also includes the cutest little witch you have ever seen! It will be available tomorrow night at the end of the release party for $15.95. I know you're going to love it! The tree is a solid image unlike any other and was so easy to heat emboss and get a really black perfect spooky tree! Be sure and join us tomorrow night starting at 8pm EST over on the SCS forum for the most fantastic release party for My Favorite Things. It's going to be right HERE. Anyway, I don't mean to scare you off so soon, but it's time to sweep the cobwebs around here, so you best leave before the walls of this house start breathing or you start sneezing. 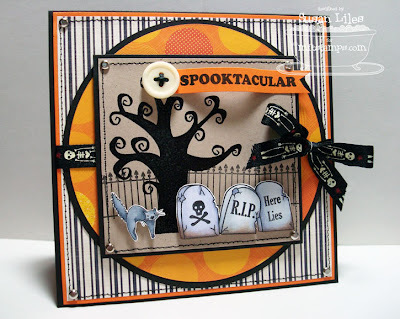 Your next haunt is over on Michele's blog, Paper Cuts HERE! SUSIE Q-TIP: Putting brads in corners where you messed up your stitching is a beautiful thing. Love how you mixed the sets, Susan!!! Too cute! Gorgeous Susan!! Hope you're feeling better soon! AMAZING!!!!! Love the whole composition! Such fun! I love your cemetary. I can't wait till tomorrow. I am loving this too cute to spook! Beautiful card! Totally LOVE IT!!! Both these sets are already on my list!!! Thanks for showing me another reason for getting it!!!! Oh this is such a beautiful Halloween card....love all the great details you have added to make this a WOW card!! Ooohh, spooktacularly awesome!!!! I love this! Those gravestones look so real! Nice job!!! Oh my this is just bootiful. Love that ribbon. As usual, your tip is great. I need lots of brads. Great cards too. wow Susan! This card is awesome!!! Love the paper and all the great images. Everything flows so nicely. This card just screams "CASE ME"!! Perfect!! I love those little tombstones! Very cute -- love the ribbon & DP. I really like your card and blog. I like the tips you offer to those of us that are novices. Thank you. Oh my gosh, this is just fantastic!!! i love it!! i cant wait to get my hands on these sets!! Great card! Love all the detail! Yoru Suzieq-tip made me chuckle. Beautiful card. Love the tombstones. Oooooh! I love the stripes and dots! What a great card! Thanks for sharing!!! Woo boo! Great job Susie. I'm looking forward to seeing the rest of the Ghoulish Labels set. And I'm totally with you on the use of brads in the corners :D.
Totally love this card! Love all the details you put in especially those tombstones. Awesome job! oh Wow, just comes to mind. The layout is PERFECT!! Great card. fun, and oh so cute card! love the layout. Very very colorful and cute! Be still my heart, I'm in love! Very spooooky! Nice job on the card. This is just amazing! I love how the whole card just pops! Amazing job! Wow!! Very, very cute! You did an absolutely fabulous job! Love the card and your tip about the brads...what a clever way to hide an "oops"!!! Wow! Love all the cutouts and layers! Really pops! I LOVE Halloween and these sets look adorable! This card is really cute! Great job! that ribbon is the cutest ever! very pretty card! Great card! Love the shading on the tombstones. Great scene! The coloring of the stones makes them look so real. I like this card a lot! I love making Halloween cards!!!! TFS! Neat card. Love all the dimension etc.!!! WOW! This is fantastic, Susan! I love your papers, the dimension...every detail! Oh, I love this, Susan! Great design and I love all the little details you added! totally spooktacular!!! love the ribbon too! Love this card. So glad you're feeling better! This is incredible Susan! I love it! That is the cutest little kitty cat I have ever seen! Adorable card! I love that tree!! ADORABLE!! Awesome card! Love how you put everything together! Love this card... great choice of papers and all the details. I don't know if I commented on this one the last time, Sus, but it is just spooook-tacular!!! Love, love, love it!